Whether this is the first car show you're hosting, or if you're a seasoned show veteran, Car Show In A Box is intended to help guide you through the sometimes-confusing process of preparing and then producing your next event. The thirteen-page manual has been created in .pdf format, so you can view it, download and save it to your computer, or print it. 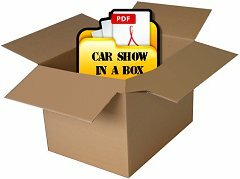 The information contained in Car Show In A Box is merely a guideline for hosting an event, but does not ensure that your event will be successful. That part is up to you and your event staff!